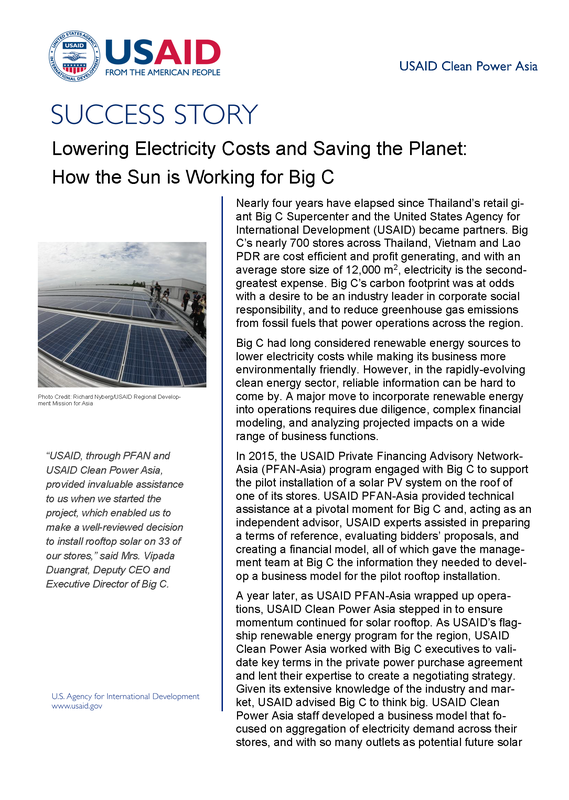 Nearly four years have elapsed since Thailand’s retail giant Big C Supercenter and the United States Agency for International Development (USAID) became partners. Big C’s nearly 700 stores across Thailand, Vietnam and Lao PDR are cost efficient and profit generating, and with an average store size of 12,000 m2, electricity is the second-greatest expense. Big C’s carbon footprint was at odds with a desire to be an industry leader in corporate social responsibility, and to reduce greenhouse gas emissions from fossil fuels that power operations across the region. Big C had long considered renewable energy sources to lower electricity costs while making its business more environmentally friendly. However, in the rapidly-evolving clean energy sector, reliable information can be hard to come by. A major move to incorporate renewable energy into operations requires due diligence, complex financial modeling, and analyzing projected impacts on a wide range of business functions.